While I haven’t talked about it here on Nerdwatch, for the last six years I’ve been annoying the ever-loving crap out of friends, family, and anyone who’ll listen with my overly-verbose opinions on why the Bond franchise has gone down the crapper. Ever since the end of the Brosnan years and the transition to Daniel Craig the writing for the ongoing series has taken a noticeably sharp change in direction. One-liners were practically nonexistent, classic Bond-isms (his shaken Martinis, his Rolex watch) were not just absent but were deliberately eschewed by the writers. Some of this was certainly meant to showcase the fact that Craig’s Bond is a younger, different character than what we’re used to. While some of that is fine, the lack of these things robbed the series of some of its charm and quirk, things which have defined the franchise since 1962. 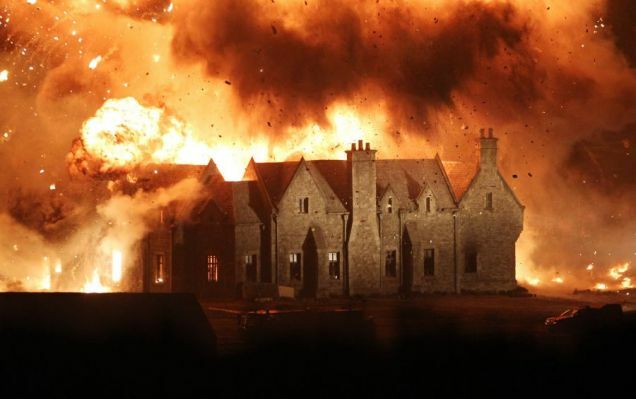 There was a very slight attempt to return to form in Quantum of Solace, what with Bond returning to his original Walther PPK and a few more attempts at one-liners and women with impossibly suggestive names, but it was all wrapped up in a substantially worse film, and it seemed to me that Bond was buried deep in one of its rough patches. And so we arrive at Skyfall, the 23rd entry in the James Bond franchise and the third to star Daniel Craig in the iconic role. I went into the movie with some trepidation (I actually went at the behest of others and only after they offered to pay for my ticket) and waited without much anticipation for the film to begin. But as the movie played out I realized something: I liked it. I was genuinely engaged throughout the entirety of the film and substantially fewer things seemed out of place for a Bond movie than have in the previous two entries. Bond might not be back in the truest sense that we’ve known him throughout the years, but with Skyfall he takes the biggest step towards beloved familiarity since Craig entered the scene. Skyfall opens en media res, in classic Bond tradition, and within minutes we’re thrown into a long, complicated chase sequence that traverses seemingly the entirety of Istanbul, from market streets to rooftops to a moving train. It’s a very well put together action sequence that then flows seamlessly into a beautiful Bond intro, with Adele delivering one of the best intro songs we’ve heard in a while for the franchise. The next bit of the film is mostly setting the stage, establishing the film as a low point for Bond and gearing up for what is probably one of the more personal stories we’ve seen in the history of Bond movies, and we’ll get into whether or not that’s a good thing a little later. But at any rate the story then kicks into gear and before long we’re tagging along as Bond hops from one exotic locale to the next in search of the MacGuffin device of choosing; in this instance a hard drive containing the names of all undercover MI6 agents in the field. In a lot of ways the various filming locations are the real stars of the movie. 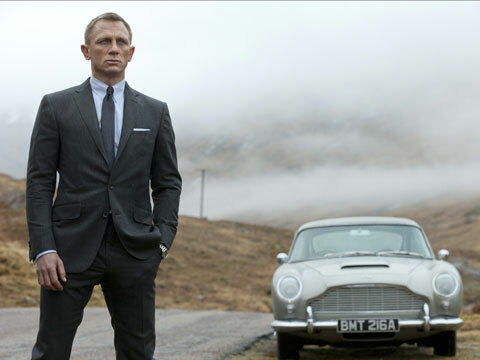 Bond has always placed a lot of emphasis on glamorous or otherwise unique scenery to serve as a backdrop to the action and Skyfall is definitely up to par in that department. The aforementioned Istanbul bazaar, a high-class gambling house in Macau, the misty hills and valleys of Scotland, and a skyscraper in Shanghai with neon projections constantly changing the look of the surrounding environment all serve as visual feasts and your eyes will be working on overload to take it all in. Pretty much all of these play host to at least one extensive action sequence, and the one in Shanghai deserves special attention for being very artistically shot. While I’ve become rather bored with action movies in the past few years, I found myself practically enraptured with this sequence, and it might be the first time I’ve been genuinely impressed with a fight scene in the better part of a decade. This being a Bond movie, however, most of these sets do explode. And it’s not just isolated to the action bits either: the entire movie boasts some great cinematography, with the camera work always making sure that every shot is engaging for the audience, either by making use of interesting angles or framing or through extensive crane or steadicam shots. In conjunction with the scenery the entire movie grabs hold of your eyes and never lets go until the credits start to roll, and at over two hours in runtime this is no small feat. The excellent technical skill displayed by the crew in combination with good pacing ensure that you’re unlikely to find yourself getting bored, unless of course you happen to dislike great moviemaking. But the most well-shot, well-choreographed movie in the world still needs something worthwhile to display, and talking about the plot of a Bond movie is somewhat tricky to do. I don’t believe you can hold the stories told in these films up to other movies and expect them to come away unscathed: even Goldeneye, easily one of the best Bond movies ever made can’t hold a candle to other more plot-focused films. Bond films are very much designed to be “fun movies”, the kind of thing that you watch simply for the experience of doing so. They’re not really meant to challenge the viewer like 2001: A Space Odyssey, A Clockwork Orange, or Full Metal Jacket (note: it should probably say something that the top three movies that came to my mind were all made by Stanley Kubrick). So I feel like I can’t really give this thing much of a literary critique. In fact, if anything I probably come down a little hard on Skyfall for trying to take itself perhaps a bit too seriously. This is almost certainly my nostalgia and minor fanboy-ism toward the franchise showing but I can’t help it: I’m a Bond fan. 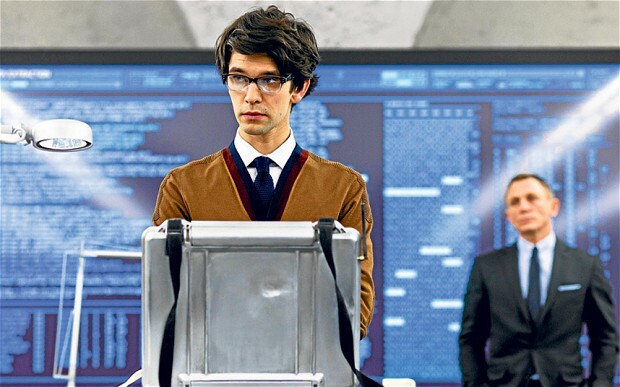 As mentioned earlier, the movie allegedly focuses on the pursuit of a hard drive which threatens the security of active MI6 agents. The hard drive itself isn’t really important for the plot, however: what is important is the position it places our main characters. Bond, disenchanted with MI6 after an order given during the en media res sequence, has to deal with his authority issues and history with M as he decides to return to the service of Queen and Country. M, for her part, is faced with the bureaucratic backlash over the leak and her slipping position of respectability, as well as her own history with Bond. Together they face an enemy with a host of similar problems, but who has taken a different stance than they and channeled his frustrations back at MI6 and at M specifically. Javier Bardem plays this villain wonderfully and adds the quirk and character to the part that’s necessary to really pull off a great Bond villain. 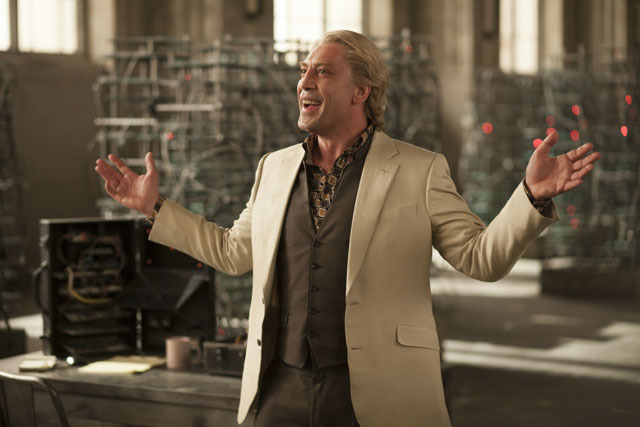 I genuinely can’t remember the motivations or nuances of the villains of the last two movies, but Bardem was a great casting choice and brought a lot of life back into the role of a Bond antagonist. If you’re evil and you love it clap your hands. All of these MI6 and past-specific elements and plot points create a Bond film that is much more personal than we’re used to. We’re more accustomed to villains building a superlaser and using it to threaten the world, and Bond, through ingenuity, charm, and a heavy dose of British patriotism shows up to save the day, usually with a smirk on his face, too. This is not the case in Skyfall. Instead we’re treated to a more involved story that deals with conflicted loyalties, regrets, and the struggles of growing old. That last bit falls a bit flat, however, as this is only Craig’s third film and he’s still among the youngest of the Bonds. Additionally that theme was explored before in Never Say Never Again, which I suppose technically falls outside of the regular Bond continuum, but even so. The Bond timeline is so muddled anyway after 50 years of movies, actors, and changing technology that it can’t really be called a “timeline” at all anymore. 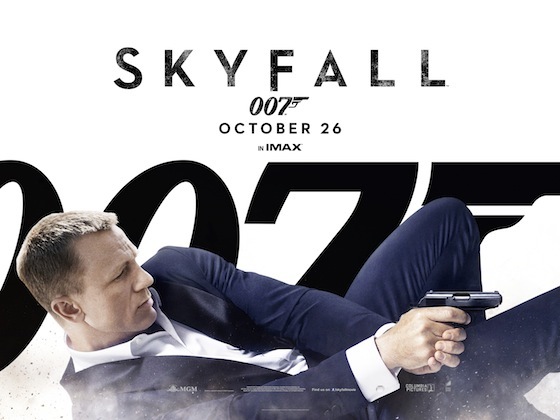 Yet despite this somewhat more serious approach, Skyfallalso shifts a bit closer to the Bond formula that we love so much. The one-liners make a return, though if anything I think they could do with being a bit cornier (and delivered with a bit more of a sly tone by Craig, who seems like he’s trying to make a Bond witticism still somehow dramatic which is entirely the wrong way to go). Also back are the shaken martinis, a greater sense of suave confidence, and the almost callous way Bond seems to interact with women (disclaimer: this is specific to his character and should not be taken as being in line with my own views or those of Nerdwatch). Also, for the first time since the Brosnan years, Q-Branch finally makes a return, though it’s a rather lackluster one. While I don’t believe anyone can ever measure up to Desmond Llewelyn, the new Q comes off as the clichéd technological “boy genius” being quite young and seemingly far more adept with a laptop than any kind of actual production of field equipment. He also delivers one of the lines that seems like a complete slap in the face to the history of Bond films, saying that Q-Branch “doesn’t go in for that sort of thing anymore” when it comes to gadgets. Gadgets are an inextricable part of Bond, and if you’re going to shun them then you might as well not even have a Q-Branch at all. I was holding out hope for a return to the exploding-pen days of gadgetry but it seems that’s not to be. There is one further betrayal of Bond tradition but it’s a bit of a spoiler so I’ll leave it alone for the purposes of this summary and let you all be disappointed on your own (or not, depending on your personal perception, I suppose). Dr. Q, working on his next project: the TARDIS. In slipping into the shoes of cinema’s most prolific secret agent, these actors understood that Bond was a man who was exceedingly confident and largely happy in his line of work (barring a few issues here and there). He’s often times an assassin, yes, and one who will kill without a second thought but in his missions to do so he enjoys himself. He smirks when he catches the femme fatale in the shower, he grins when he beats someone at Baccarat, and he exudes smugness when he delivers that final one-liner to the big bad. In any other movie this would be deeply disturbing, but because Bond lives in a fictional, fantastical world where moon bases and cars with rocket engines are parts of everyday life for the characters, we know we’re just supposed to have fun with it and indulge in a bit of quirky, if albeit somewhat dark, humor. Craig unfortunately lacks that same charm. His one-liners aren’t said with a smile, but with a grimace as he punches someone out with Jason Bourne-like dryness. It’s true that this was a story that delved more deeply into Bond’s character and his past (a story that I don’t think really needed to be told, quite honestly), but it still doesn’t seem like Craig has really caught on to what makes Bond Bond, and I think the legacy of the character suffers for it. It’s not due to bad acting or anything of the sort, it’s just not the portrayal of Bond that a lot of us are looking for. In the same way, that was my impression of Skyfall as a whole. It’s a movie that doesn’t quite understand itself, struggling with an important legacy and a recent shift in tone and interpretation as it tries to bring the two together. People looking for the vaguely campy, charm-filled Bond can’t find it due to the grim tones of the plot, and people looking for a grittier spy movie can’t find it due to the jokes and over-the-top setpieces. Normally this would result in a movie that pleases no one but Skyfall somehow manages to miss the mark for both audiences yet still hit just close enough outside the black that we can still be fairly happy with it. Bond or not, Skyfall is probably the best action movie I’ve seen in a very long time and it gives dinosaurs like me some hope that the future of the Bond franchise still shows some promise of returning to its glory days.